Initially, the s.c. PTZ test is conducted in groups of mice (n = 4) at two different time points (0.5 and 4 h) after the intraperitoneal (i.p.) administration of a wide range of doses (e.g., 30, 100, and 300 mg/kg) of the investigational AED. These doses and times provide a preliminary estimate of the efficacy of a drug against s.c. PTZ-induced seizures. Positive results are confirmed in more extensive time- and dose-response studies (see below). All tests are conducted between 0800 and 1400 h.
1. At the time of the test, PTZ (85 mg/kg) is injected s.c. into a loose fold of skin in the midline of the neck. This dose of PTZ represents the average CD97 for CF1 mice in the ASP laboratory. Each laboratory should determine its own CD97 (see below). It is important that the site of injection be massaged in order to distribute the PTZ solution throughout the subcutaneous tissue. If the PTZ solution is injected into adipose tissue and care is not taken to distribute it by massage, the likelihood of false positives is increased. PTZ is administered as a solution of 0.85% in a volume of 0.01 ml/g body weight. 2. 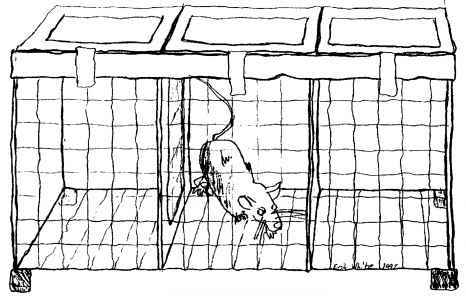 Mice are then placed in individual wire-mesh isolation cages (7 cm wide by 10 cm deep by 10 cm high) and observed over the course of the next 30 min for the presence or absence of a minimal clonic seizure of the vibrissae or forelimbs (Figure 2.1). Since a brief episode may persist for only 3 to 5 s, it is imperative that the investigator pay extremely close attention to each animal. 3. Animals not displaying a minimal clonic seizure are considered protected. It is important to physically isolate individual mice because when aggregated they will likely display a different response than when tested individually.10 For example, when placed in a group, a seizing mouse may lower the threshold of the remaining mice. Thus, a relatively small drug-induced elevation of seizure threshold could be masked by such an aggregate effect. Likewise, a drug-induced lowering of seizure threshold could be artificially enhanced by an aggregate effect. In the event that no protection is observed at any of the prescribed doses or times by the investigational AED, no further testing is undertaken. However, in the event that protection is noted at a given dose and time, a more extensive time course (0.25, 0.5, 1, 2, and 4 h) is conducted to determine the correct time of peak effect (TPE) of the test substance. Subsequent testing at the TPE in groups of 8 to 10 mice using multiple doses of the test substance is then performed to quantitate the dose-response relationship of the drug. For the quantification studies, the dose of the test substance is varied until a minimum of three dose levels has been tested, with at least two points lying between the limits of 0% and 100% protection. The medium effective dose (ED50) and 95% confidence interval are then calculated by probit analysis.11 Although the above description applies to mice, identical studies can be undertaken with rats (n = 8 to 10 rats per group), provided that the appropriate CD97 of PTZ (e.g., 70 to 90 mg/kg) has been employed. 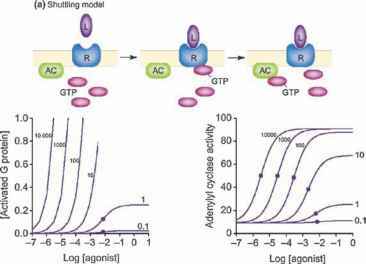 The CD97 is estimated by injecting various doses of PTZ into groups of eight mice. Individual mice are observed for the presence or absence of a minimal clonic seizure; the number of mice in each group displaying a seizure is recorded. The CD97 and 95% confidence interval can be calculated by probit analysis. As discussed below, choosing a different seizure endpoint is not without consequences when attempting to interpret the results obtained from the s.c. PTZ test. For example, the pharmacological profile associated with PTZ-induced "minimal" clonic seizures is more discriminatory for drugs active against generalized absence and myoclonic seizures, whereas the profile associated with PTZ-induced tonic extension is nondiscriminatory with respect to clinical classes of AEDs (see discussion below).